Fans of Alice Waters will get a fresh look at the famous chef and her restaurant. Written in the voice of her daughter, Fanny, Waters presents a collection of stories about her daughter as a young child growing up in the milieu of a busy restaurant dedicated to serving fresh, sustainable, locally grown food. Sometimes this means filling the car with loads of food for the restaurant, other times it involves sampling the finished product, but it always means appreciating the value of high quality food with its appearance and fragrance as well as its taste. The story follows the experiences of Fanny as she helps her mother run the restaurant. Fanny sorts berries for desserts, helps make pasta, and tends to the needs of an old yellow cat who lives on the back porch of the restaurant. She tells us about the bread chef who used to be a busboy, the waiter who makes up stories to pacify customers, and the florist who fills the restaurant with branches and giant stems of flowers. We learn that the favorite food of Alice Waters is salad that Fanny’s dad taught her how to appreciate the bouquet of wine, and that stock pots in the restaurant served as playpens for Fanny when she was a baby. Forty six simple recipes with personal anecdotes complete the work. The stories are charming and underscore the principles that the author holds dear: the glories of fresh produce, the importance of organically grown food, and necessity of sustainability. The recipes are aimed at young children and range in difficulty from super easy (lettuce salad), to more complex (risotto) that would probably require the help of an adult. The whimsical illustrations add a lively and colorful addition to the text. Good selection for interesting kids ages nine to twelve in cooking or a good dining experience. 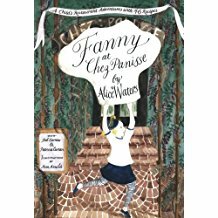 To buy Fanny at Chez Panisse from Amazon.com Click Here.